The Walt Disney World Resort has released it's Extra Magic Hours, Operating and Event schedules for June 2012. For guests visiting during this time, you will want to visit the Park Hours and Events pages to aid in planning your trip. Remember, all times and schedules are subject to change, so check back often. The Force was with Walt Disney Parks and Resorts recently when Star Tours – The Adventures Continue earned one of four top Disney honors among the 18th annual Thea Awards announced by the Themed Entertainment Association (TEA). Star Tours – The Adventures Continue took a Thea Award for Outstanding Achievement – Attraction Refresh. Other top Thea Awards went to The Magic, The Memories, and You! at Magic Kingdom in Walt Disney World Resort for Outstanding Achievement – Show Spectacular and to Animation Magic at Animator’s Palate aboard the soon-to-launch Disney Fantasy cruise ship for Ingenious use of Technology. A little gardening magic will go a long way when an eight-foot-tall floral Sorcerer Mickey topiary holds court at the entrance to the 19th Epcot International Flower & Garden Festival March 7-May 20, 2012 at Walt Disney World Resort. Standing atop a 12-foot-tall floral mountain cliff and towering above the park’s front-entrance topiary bed, the commanding Sorcerer Mickey will direct a riot of color in the manicured shapes of dancing broomsticks, buckets, mushrooms, hippos, alligators and elephants straight from the classic Disney film, “Fantasia.” The front-entrance floral spectacle will welcome guests to a festival packed with new displays, featured speakers and hands-on fun for all ages. The festival, including all gardening programs and exhibits, is included in regular Epcot admission. Lots to talk about in the latest edition of the INTERCOT Insider Live including John's stay at Animal Kingdom Lodge, Mel & Carol at Bay Lake Towers and Gary at Pop Century. We also cover Food and Wine Festival favorites, Disney Weddings, Preferred Stroller Parking and our best of Disney Castmember Costumes. Oh, and we announced the official dates for the INTERCOT 15th Anniversary Celebration in October 2012. Combine some of the world’s finest automobiles with a track specifically designed for drivers to safely experience their awe-inspiring acceleration, speed and handling and you have “Exotic Driving Experience”, the latest offering from Petty Holdings. Exotic Driving Experience will feature supercars by Ferrari, Lamborghini, Audi, and Porsche. Future plans include the addition of other exotic models, as well. Driving Experiences will start at $189 for six laps around the circuit. Thrill Rides with a professional driver at the wheel will be available for $99. It will officially begin on January 16, 2012. Reservations for 2012 can be made by calling 815-822-0149. 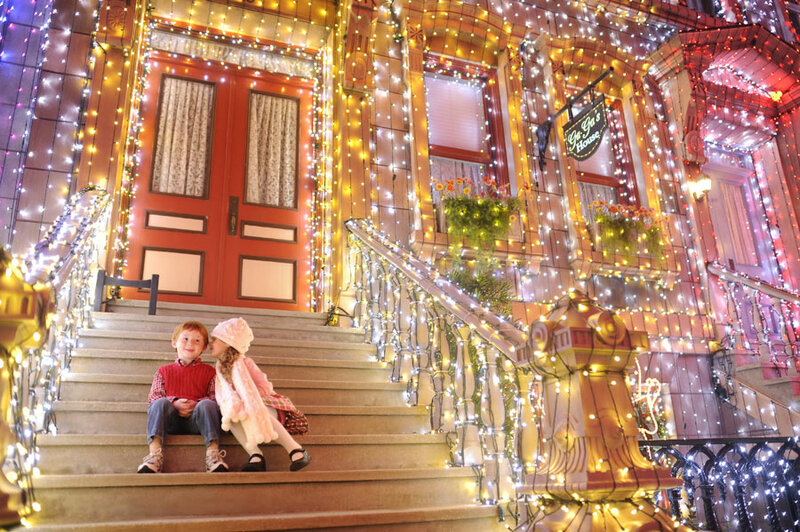 Osborne Family Spectacle of Dancing Lights Returns to Disney's Hollywood Studios Tonight! The annual display of holiday cheer, which features millions of dazzling lights, will return to Disney’s Hollywood Studios tonight. From now until Jan. 7, 2012, the cityscape and building facades in the park’s Backlot area will be draped in multicolored lights that periodically “dance” to holiday tunes. In addition to the buildings, the area will also feature illuminated carousels, angels, Santa Claus and other figures. (The spectacle will not be operational on Dec. 8). This offering actually began in 1986 in Arkansas, at the home of businessman Jennings Osborne, who strung 1,000 lights as a Christmas gift to his daughter. The exhibit was transported to Disney in 1995 and is a popular holiday draw for many guests. The holiday season will officially begin this Friday, Nov. 4, with the return of Cinderella’s Holiday Wish and Castle Dream Lights at Magic Kingdom Park. During the Cinderella’s Holiday Wish stage show, Mickey Mouse, Minnie Mouse, Donald, Goofy, Pluto and Cinderella appear to admire the lovely holiday decorations at the park. Then they share their ideas on how to decorate Cinderella Castle for the season. Fairy Godmother appears to help bring Cinderella’s suggestion to life – covering the castle in glittering ice, making it look just like her special glass slippers. You can see the show nightly at Magic Kingdom Park throughout the holiday season.